One of the best things about Christmas is being surrounded by the most important people in your life. For us, that means planning a hefty festive food itinerary to treat our guests with something deliciously different from your usual pigs in blankets. As much as we love cooking, the last thing we want at Christmas is to be chained to the stove all day – which is why we always stick to three rules: keep it seasonal, keep it foolproof and keep it simple. 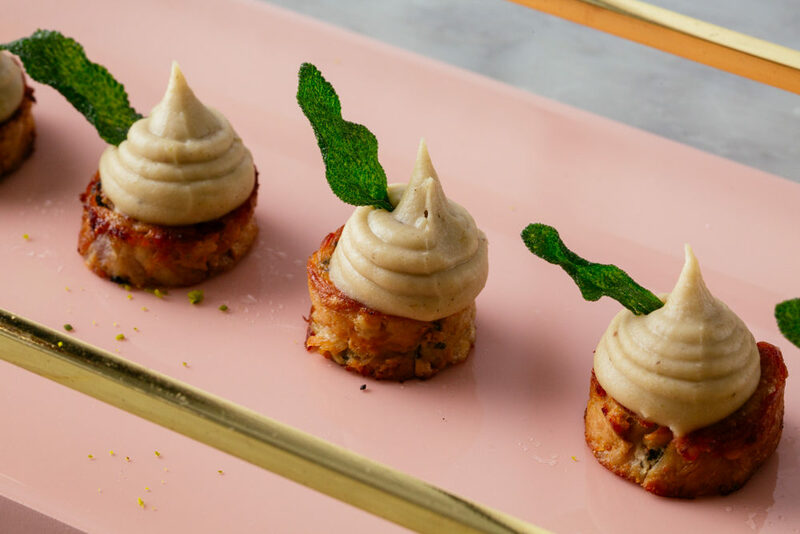 Canapés are a fun and creative way to keep your guests satisfied; serve some tasty nibbles with a refreshing glass of fizz and you’re already on to a winner. 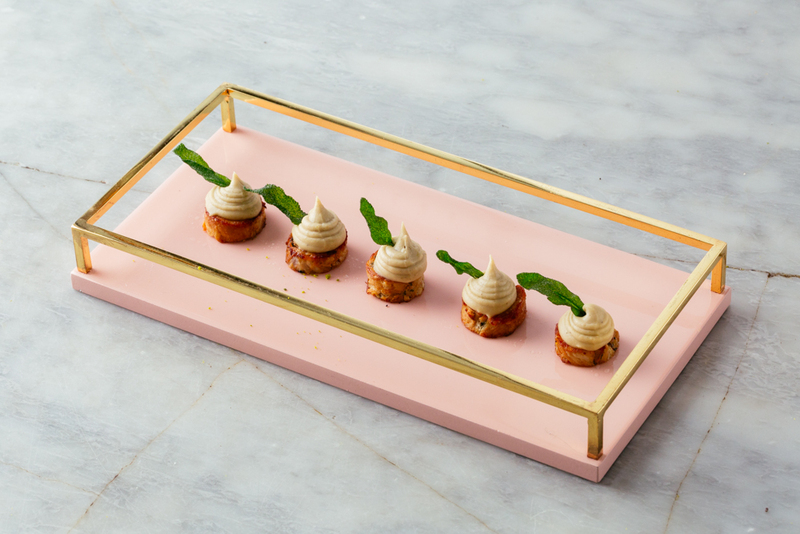 One dish we’re championing this year is our head chef Richard Gynn‘s pork belly and sage stack with chestnut puree… DELISH. Richard used a tasty cut from our friends at The Ginger Pig for a totally flavoursome and more-ish mouthful. 1. Preheat oven to 100 degrees. 2. Take the pork belly and cut it into 20 cm strips. Take each strip and with a knife, cut each strip length ways so you end up with 2 x 20cm strips out of each strip. 3. Rub each strip with sea salt flakes, chopped garlic and sage, (save the best looking sage leaves for garnish and the stalks for later on) roll up and tie with butchers string so that they don’t unravel. Place them in a deep roasting tray. 4. Melt the duck fat in a saucepan over a medium heat. Pour the melted fat over the pork belly rolls so they are completely covered. Cover with parchment paper then foil and place in the oven until tender (approx. 5-6 hours). 5. Remove pork rolls from the duck fat and leave to cool slightly. Once cool enough to handle, cut off the butchers string and roll tightly in cling film, leave to set overnight in the fridge. 6. To make the puree, chop up the cooked chestnuts into a sauce pan, add the milk, cream and 2 sage stalks, bring to the boil and simmer gently until the liquid has thickened slightly and the chestnuts are soft. 7. Add the mixture to a food liquidiser/blender and puree until smooth and shiny, put the mixture into a piping bag. 8. With the remaining sage leaves, take a microwave safe bowl and cover the top with cling film so it is like a drum. Dip each sage leaf in a little vegetable oil, place on the clingfilmed bowl and cook on full heat for 30-60 seconds until crispy, season lightly with salt and place on a piece of kitchen towel to soak up any excess fat. 9. Unwrap the pork belly from the cling film and cut into 1cm pieces. Lightly pan fry in a splash of oil, pipe on the chestnut puree and finish with the crispy sage leaves.